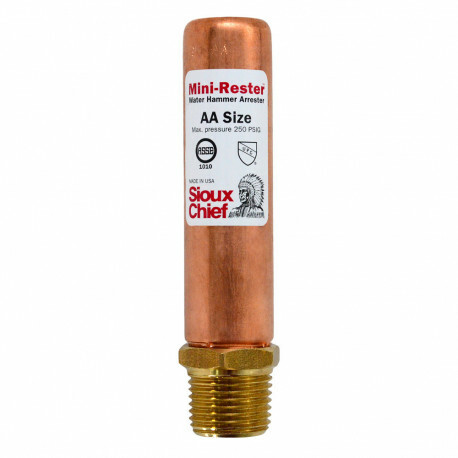 1/2" male threaded Mini-Rester water hammer arrestor by Sioux Chief. Connects to a 1/2" female threaded (FNPT/FIP) outlet. Generally installed upstream of the quick-shutting valves. Lead-free compliant and approved for potable water use. Materials: lead-free brass connector, copper body (chamber), poly piston, EPDM rings lubricated with FDA approved silicone compound.